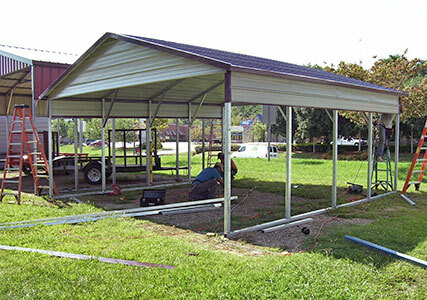 The carport installation process begins with deciding on the location for your carport. 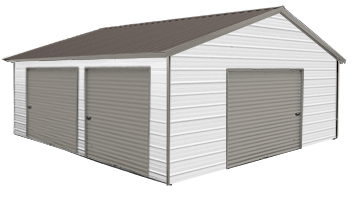 Pricing includes carport installation (or metal garage installation) on your level surface. Regular style and Boxed Eave Carports will require a site to be no more than six inches off of level. 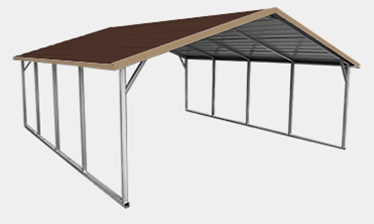 Vertical Roof Carports are more exact and require the site to be within a couple of inches of level. An easy way to choose your site is to park the vehicles you want to cover, measure around the vehicles to determine the size that best covers your area, and then select the size carport in our builder that best matches your measurements. After you have determined the size of your unit, the next step is to determine the roof style. 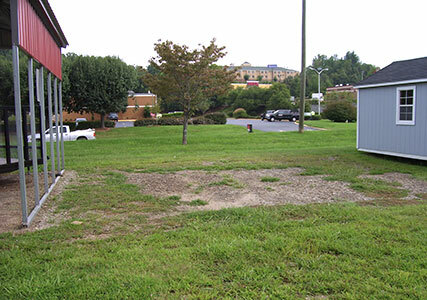 Scott says: "The closer to level you can get the site before carport installation, the better." 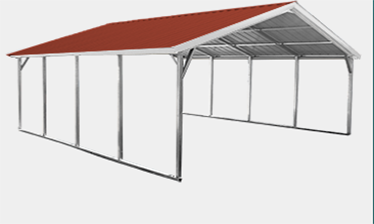 Three different roof styles are available: Regular Roof, Boxed Eave Roof and Vertical Roof. Each style is pictured and priced accordingly. Scott says: "Any of these roof styles will give you a quality carport or metal garage that will last for many years to come." Which Gauge Framing for Your Custom Carport? Scott says: "Upgrading to 12 gauge, 2 Â¼" square tube framing includes a 20-year rust-through warranty." Is a certified carport right for you? 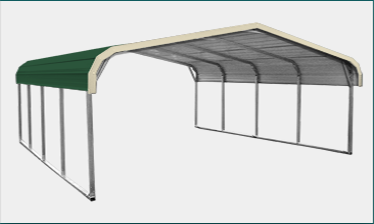 All carports up to 24 feet wide are priced as uncertified (standard). 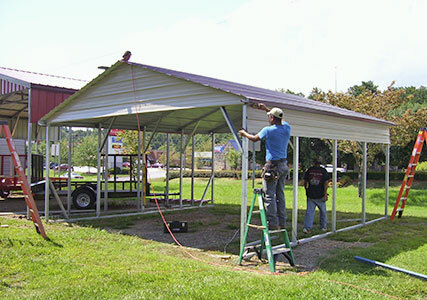 Certified carports are for use in areas where building permits are required. They are designed by a professional engineer to meet specific wind and snow loads. Check with your local inspections department for specifications in your area. Certification simply means the building is built to specifications and is certified by a professional engineer, much like a contractor builds a house to meet state and local building requirements. A copy of engineered plans will be supplied upon request after the order is placed. Raised seal plans may be purchased for an extra charge if they are required by the permitting jurisdiction. Either mobile home anchors (for ground installation) or wedge anchors (for concrete installation) are included with certified structures. The certified carport upgrade is available for a minimal charge. 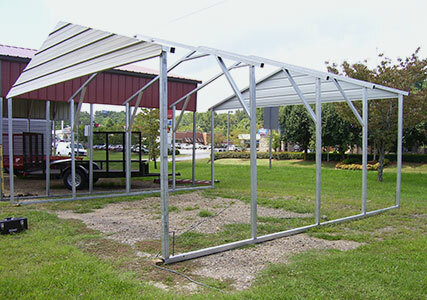 Scott says: "The certified price includes extra corner bracing and anchors for all carports and garages that have side walls taller than 8 feet." How Tall Will Your Custom Metal Carport Be? 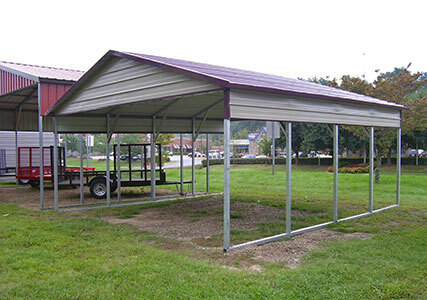 Starting side height for all carports up to 24 feet wide is 6 feet. Maximum leg height available is 12 feet, and 14 feet for some larger units. Pricing is determined in one-foot increments. 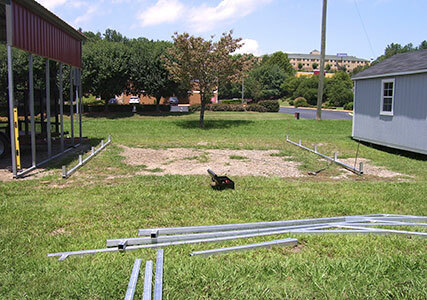 Scott says: "Carports with leg heights of 8 feet and higher require heavy corner bracing." A number of options are available for customizing your carport prior to installation. Gable ends: Hides framing and braces for a cleaner appearance. 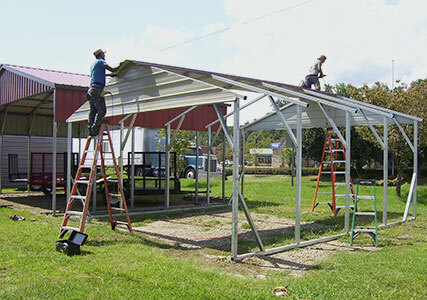 Provides more side-to-side strength with additional framing support and steel panels. Provides better protection from the sun and from blowing. Scott says: "Remember, a gable end will have the same clearance as your leg height. So, make sure you order the carport tall enough for your specific needs." Sides Closed: Provides better protection from the sun, wind and rain. Provides additional strength from back to front. Side Panels: If you prefer partially-closed sides, additional side panels are available in the options list and priced accordingly. Scott says: "Remember: the taller the carport, the more open it will be on the sides. So, closing the sides will give you maximum coverage." Closed Ends: Closing the ends will convert your carport to a garage-style building. Pricing is listed separately for each end. Scott says: "Front or back enclosures include the gable end in the pricing." Garage Doors: Metal roll-up doors may be added to the front and back of your carport. Scott says: "Remember: the side leg height must be taller than the height of your door. All metal garages will require the side leg height to be at least 1 feet taller than the door height." Walk-in Doors: Two sizes of walk-in doors are available for installation on any wall. Windows: Standard 30" x 30" or 30' x 36" windows are available for installation on any wall. Extra Anchors: Mobile Home Anchors may be added to any carport installed on the ground (dirt or gravel) for $54 each including installation. Scott says: "I strongly recommend that Mobile Home Anchors be added to carports installed in high wind areas." Thirteen different colors are available for your roof, sides and trim at no additional charge.